As I noted in my June Cheesecake post, strawberries and June just go together. I thought this sounded like a cake that would be moist and flavorful. It certainly was all that and more! 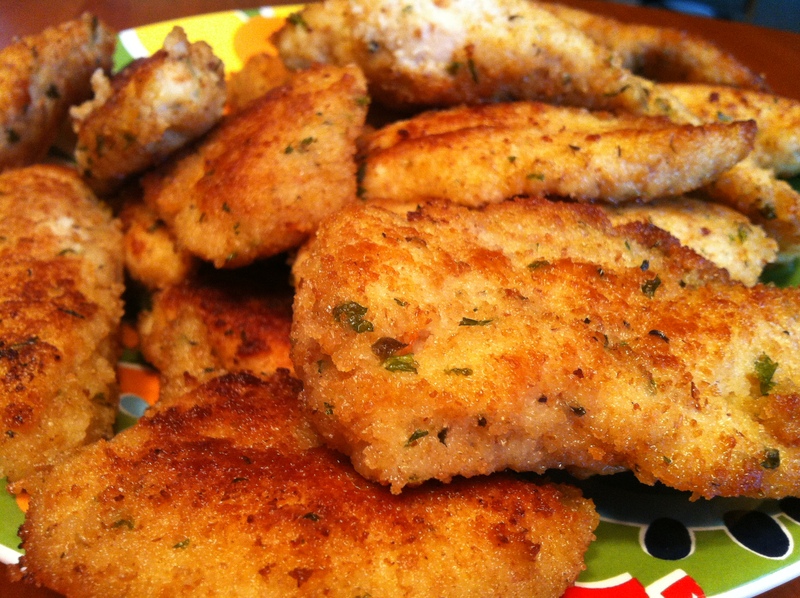 I found this recipe at a blog called foodista. I actually followed the recipe as is and did not make any changes. Here you go! 1. Preheat oven to 325 degrees. In a bowl, stir together flour, baking soda and salt. Mix in the lemon zest and set aside. 2. With an electric mixer, cream together the butter and sugar until light and fluffy. 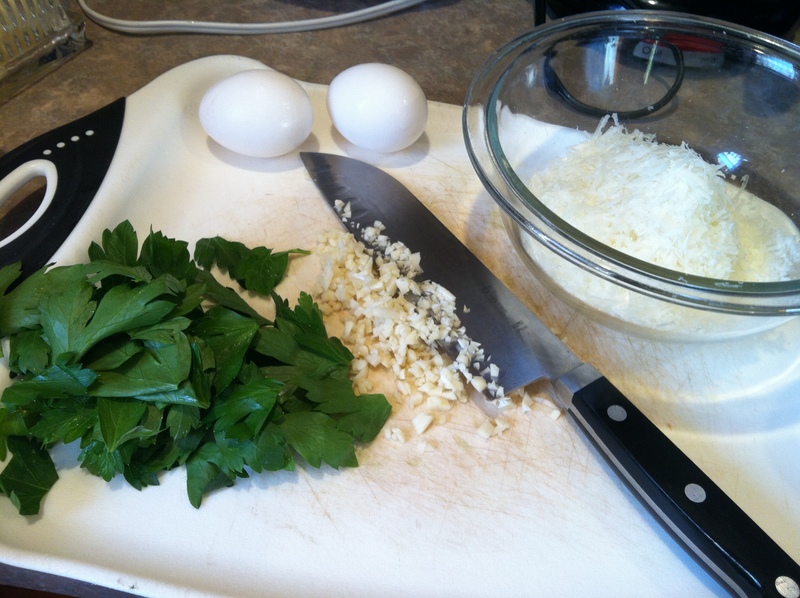 Beat in the eggs one at a time, then stir in lemon juice and almond extract. Alternate beating in the flour mixture and the yogurt, mixing just until incorporated. Gently stir strawberries into the batter. 3. 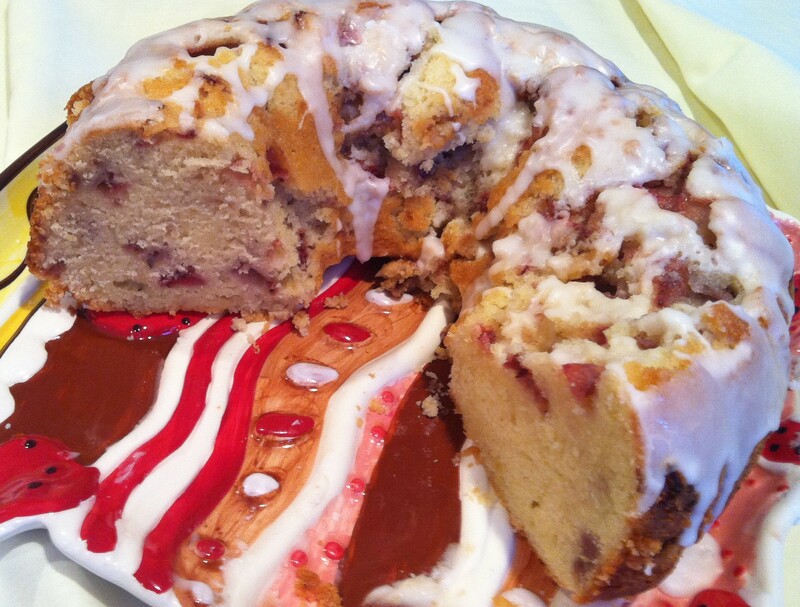 Pour the batter into the Bundt pan. Bake for 70-75 minutes, or until a wooden pick inserted into the center of the cake comes out clean. 4. Allow to cool 25 minutes in the pan, then turn out onto a wire rack and cool completely. Once cooled, whisk together the powdered sugar and lemon juice in a small bowl. Drizzle glaze over top of the cake, letting it drip down the sides. I came across this recipe and thought I would give it a try. I get bored doing the same pizza dough each week so I try to change it up every now and then. This has gone over very well the last couple of Fridays. 1. Using warm water (recommended 80 degrees F), add yeast and wait 5 minutes to be sure it is activated. I add 1/4 teaspoon of sugar and that always gives the yeast a wake up call. Add the oil into the yeast water and mix with a whisk or spoon. 2. 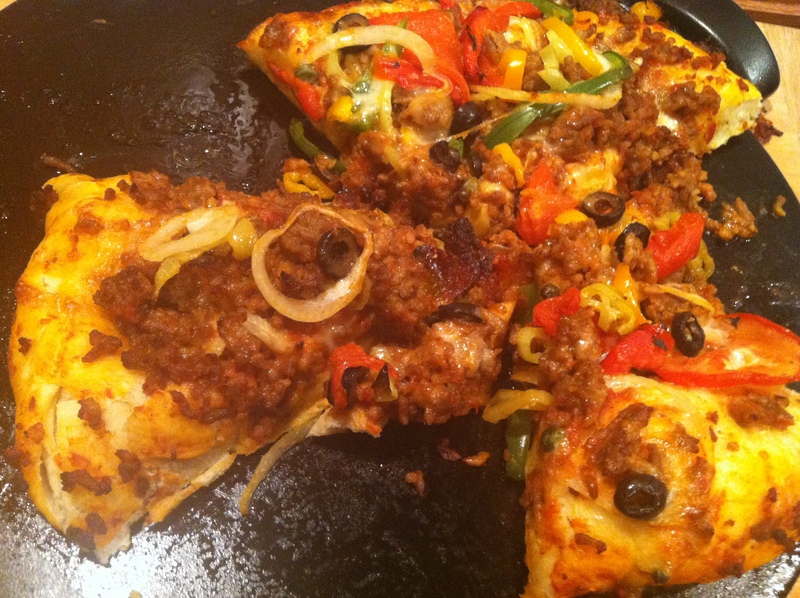 I use my food processor for all my pizza doughs. You can also use your stand up mixer with a dough hook. If you are strong you can mix by hand. I love my food processor 🙂 I put the flours and salt and pulse the dry ingredients. 3. Add liquid and mix until a ball forms. In your food processor this will take about 30-45 seconds. In the stand up mixer with the dough hook mix on lowest speed for 10 minutes. 4. Allow dough ball to rest for 30 minutes in a bowl covered by a damp kitchen towel. I put a light coating of olive oil in the bowl. 5. After 30 minutes, divide the dough ball into 3 equal parts. I then place each of the dough balls in their own plastic storage bag. I lightly spray each bag with a coating of Pam. 6. Place bags in refrigerator overnight and you are ready for the next day. The dough can then be used for the next several days. One thing I have to mention. I use a pizza stone for all my pizzas. You should preheat your oven to as high a temperature as you can. I preheat to 500 degrees. I then prepare my pizza on my pizza peel. I transfer the pizza from the peel to the preheated pizza stone. It makes a difference in how your crust bakes. If you don’t preheat your pizza stone (or whatever you use for your pizza) the crust will not bake as evenly on the bottom and may be “doughy”. That is just from our experience. Hope you enjoy this recipe! I came home from work today with some fresh asparagus. I was ready to make a recipe that a friend thought I should try. It was a pasta recipe but I was going to add the asparagus to get my “5 a day” fruit and vegetable quota. Eric came downstairs and said he would like me to make Pasta Carbonara. I suggested he pick out a recipe and if it was simple enough I would do it. Well, it was definitely simple and of course delicious. Took no time to make too. Guess what, while I am slaving over the stove 😉 one of his friends called him to go and hang out. He left me in that kitchen!! Lucky for him there was some left and when he returned, he tried it and enjoyed it. Rachel, Kent and I were able to have it for dinner and thought it was very tasty. Kent did say it definitely had garlic. If anyone knows me you know I LOVE garlic, so beware!! Another nice thing about this recipe is it takes about 30 minutes. Great to make after a long day at work. 1. Prepare the sauce while the pasta is cooking to ensure that the spaghetti will be hot and ready when the sauce is finished; it is very important that the pasta is hot when adding the egg mixture, so that the heat of the pasta cooks the raw eggs in the sauce. 3. Meanwhile, heat the olive oil in a deep skillet over medium heat. Add the bacon and saute until the bacon is crisp. Toss the garlic into the fat and saute for less than 1 minute to soften. (Be careful not to brown the garlic, pay attention!) Been there, done that! 4. 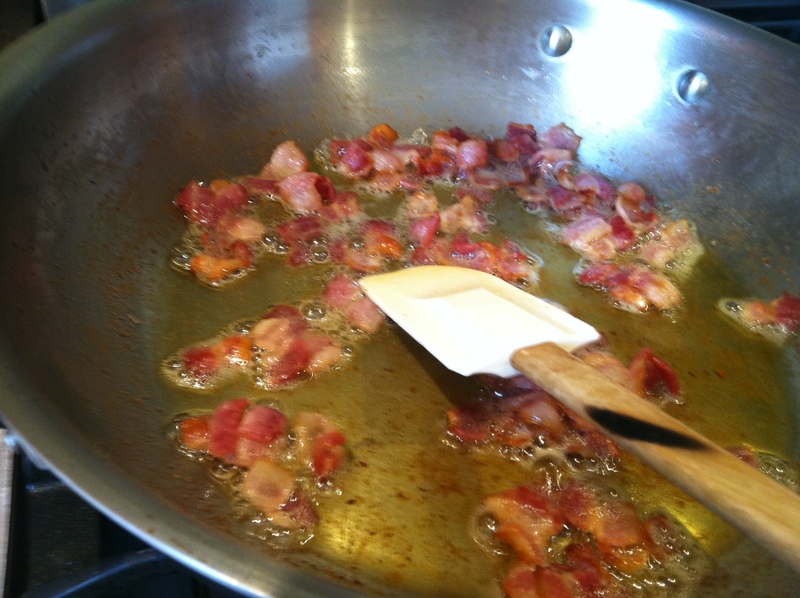 Add the hot, drained spaghetti to the pan and toss for 2 minutes to coat the pasta in the bacon fat. 6. Thin out the sauce with a bit of the reserved pasta water, until it reaches desired consistency. 7. 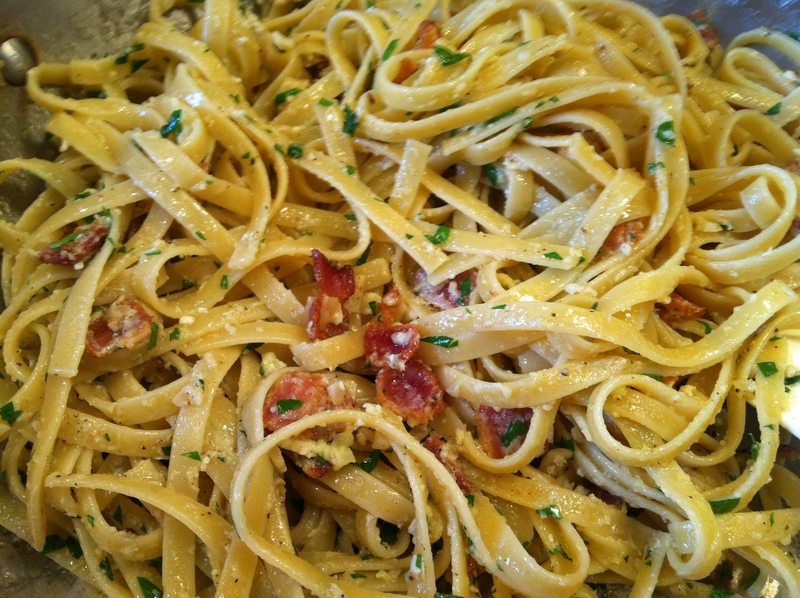 Season the carbonara with freshly ground black pepper and taste for salt. (With the parmigiano cheese and the pasta that cooked in salt water, I did not need any added salt). I added the chopped parsley to the entire dish. 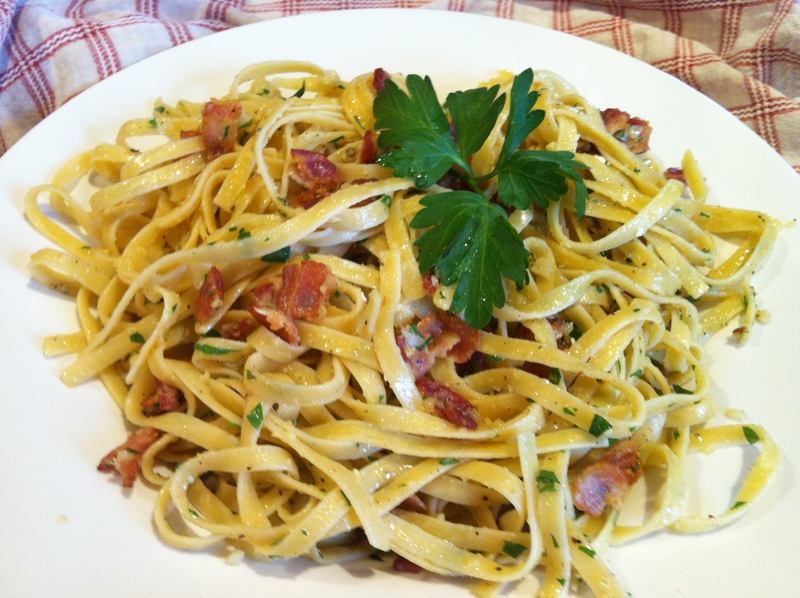 You could also mound the spaghetti carbonara into warm serving bowls and garnish with chopped parsley and top with more cheese. Your choice, whatever pleases you! 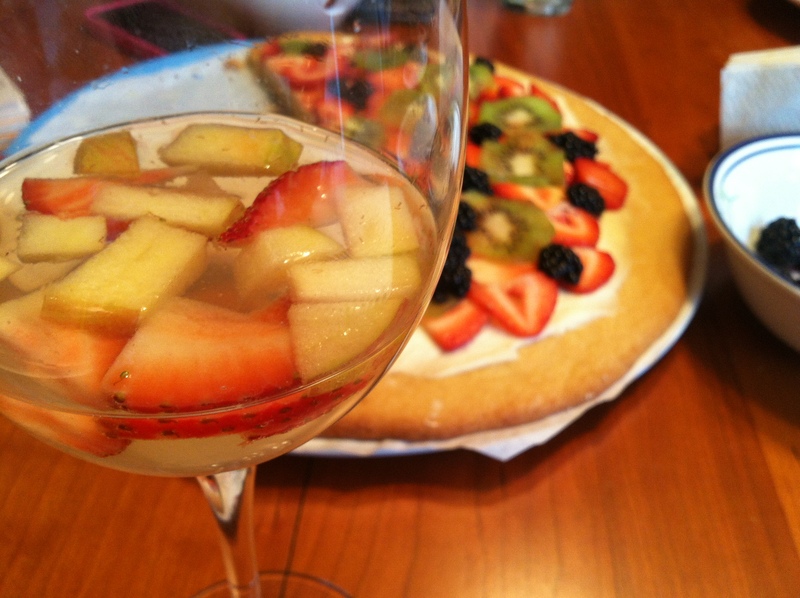 Pizza Friday – Sangria tonight! Another Friday come and gone. I begin my week trying to think of what the family would enjoy for our Friday get together. I always ask everyone what they would enjoy for their Pizza Friday. We can always guarantee a cheese pizza and a sausage pizza. I like to make other things that we all enjoy. Last Friday I had a request from one of the guys that come with Martin, his name is Eric V. He said he really enjoyed the Purple Pig pizza. That was the beginning of our next Pizza Friday. 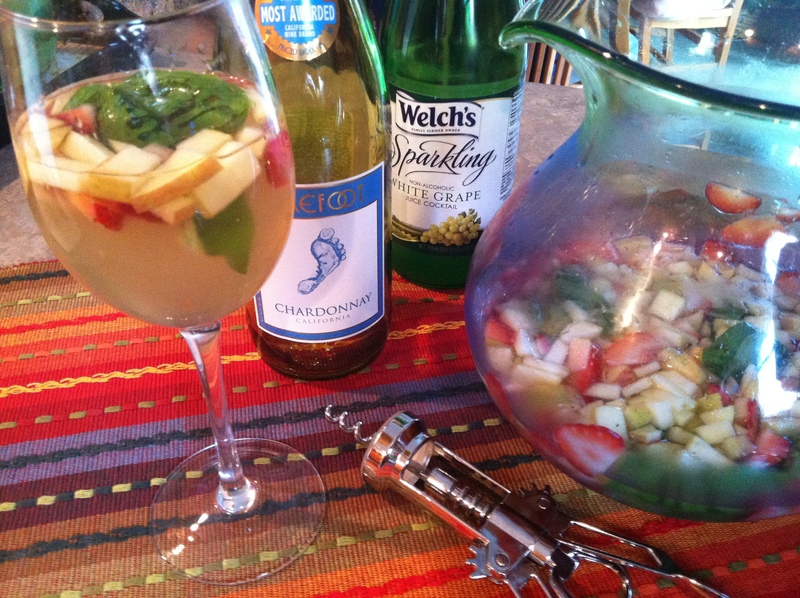 Then this week while cruising Pinterest I found a Sangria. I have never made a Sangria or even desired one. I mentioned the ingredients to Rachel and that started another addition to our menu. After I told her about the Sangria she suggested a Fruit Pizza. 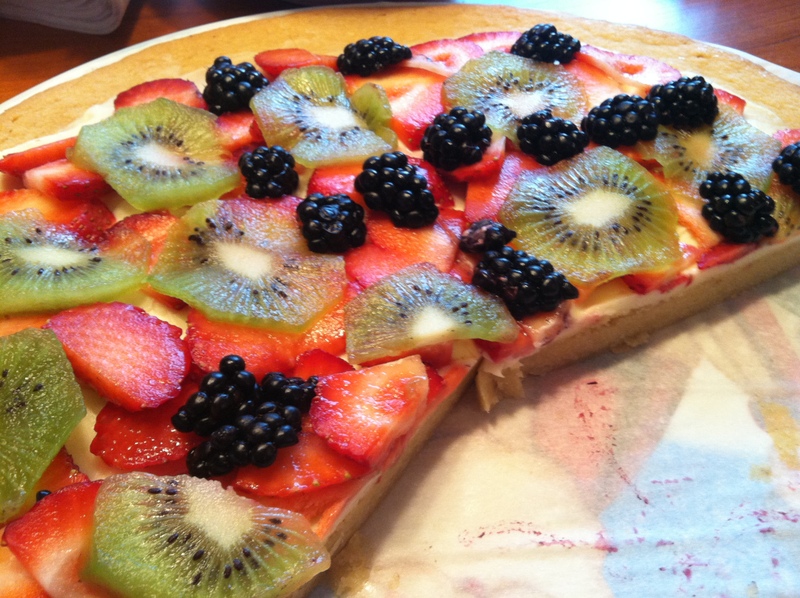 So, we have Purple Pig Pizza, Sangria and Fruit Pizza. Another addition was chicken tenders. 1. Layer thinly sliced strawberries and diced apple. Top with 2 Tablespoons sugar. Top with whole basil leaves. Let set for 10 minutes. 2. Add bottle of Chardonnay and sparkling white grape juice. Let rest of 30 minutes. 3. Then ENJOY!! This was really refreshing and delicious!! We got into taking pics but not of us only of the food. Maybe next week we can enjoy some photos of us having a great time. Enjoy this simple and delicious and refreshing drink. This is great for spring, summer, winter or fall. Use whatever fruits are in season and enjoy! Until next week. Salute and Ciao!! 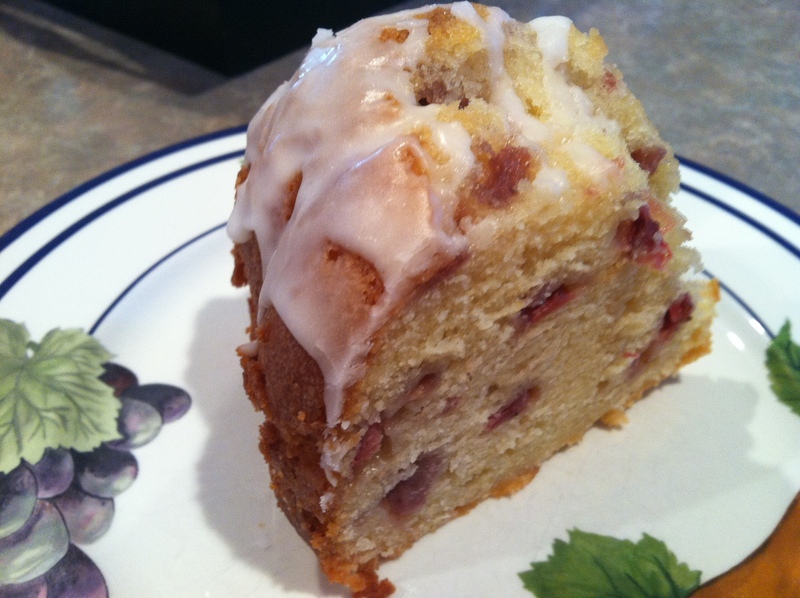 I was trying to think of what my July bundt cake would be. I decided chocolate is always a good choice. 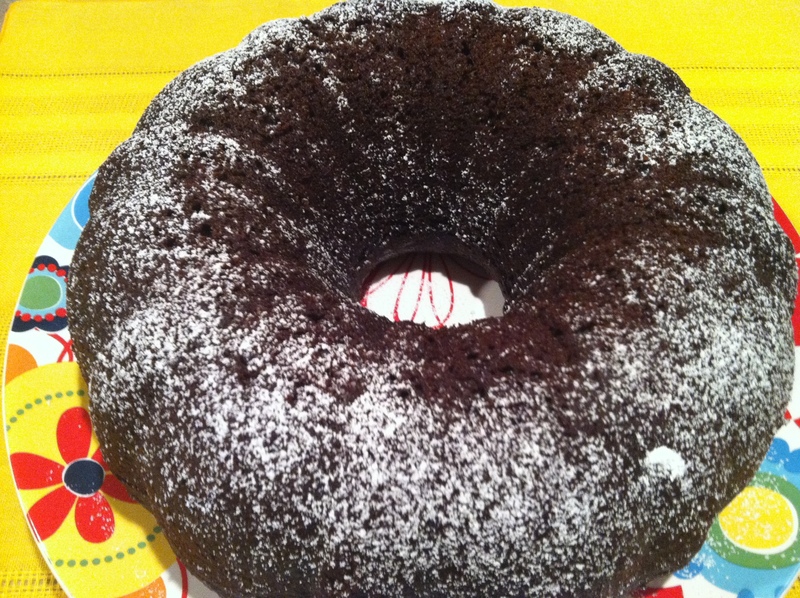 I was checking different websites and came across a Chocolate Whiskey Bundt cake. I am not a fan of whiskey but I thought the Tia Maria I have collecting dust in my cabinet might give a great boost of flavor. This is a very moist and rich, chocolate cake. If you don’t enjoy it I would be very surprised. And of course this cake is “simple AND delicious”! 1. Put oven rack in middle position and preheat oven to 325°F. Butter bundt pan well, then dust with 3 tablespoons cocoa powder, knocking out excess. 4. Whisk together eggs and vanilla in a small bowl, then whisk into cooled chocolate mixture until combined well. 5. I added the chocolate mixture into the flour mixture and whisked until just combined (batter will be thin and bubbly). Martin popped over tonight with Brenda and they both enjoyed it. Brenda, however had 2 pieces and could have had more. She did say it was very moist too. Tomorrow Rachel and I will check it out. Hope I have leftovers to bring to work Monday! 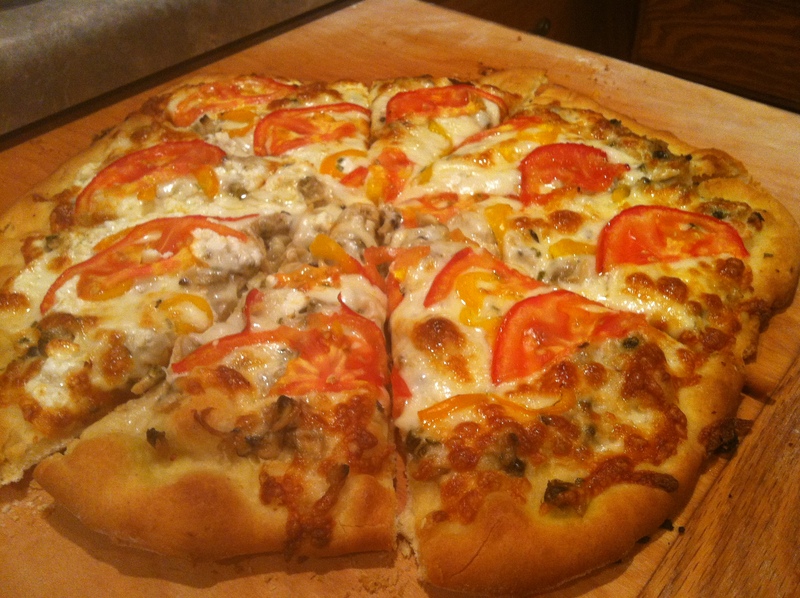 Pizza Friday – Clam Pizza?! We have had many pizza nights since this post. I really don’t want to bore the average american with my food blog about my family. We really do love to be together and I dread the day these wonderful times will end. I think the only people that read this blog are myself and maybe my long, lost, awesome friend Jill. However, it gives me great pleasure to share with the occasional drifter who may pop into my blog, my crazy recipes (and not so crazy) and family (which is more crazy than you will ever know) stuff! The clam pizza was specifically what Martin wanted and actually he put it together when he came over tonight. He had memories of a clam pizza ?! when he was a young child in Sofia, Bulgaria. We tried to find an idea going online for him to see if we could find a recipe/menu idea pf his experience as a young child. We did not succeed. This is what we/he came up with. We had an olive oil with minced garlic base, topped with clams (sadly, I used canned clams). I wanted to be sure this was a pizza people would enjoy. Clams in Green Bay are expensive and I am really not sure if they are any better than canned clams. Next time, we will see. After the clams, we put some green pepper, onion, a bit of fresh rosemary, mozzarella, and delicious feta cheese. Martin loved it and took the rest home. Rachel was not impressed. No one else tried this one. I guess we are WIMPS! The pizza supreme I made was quite delicious. 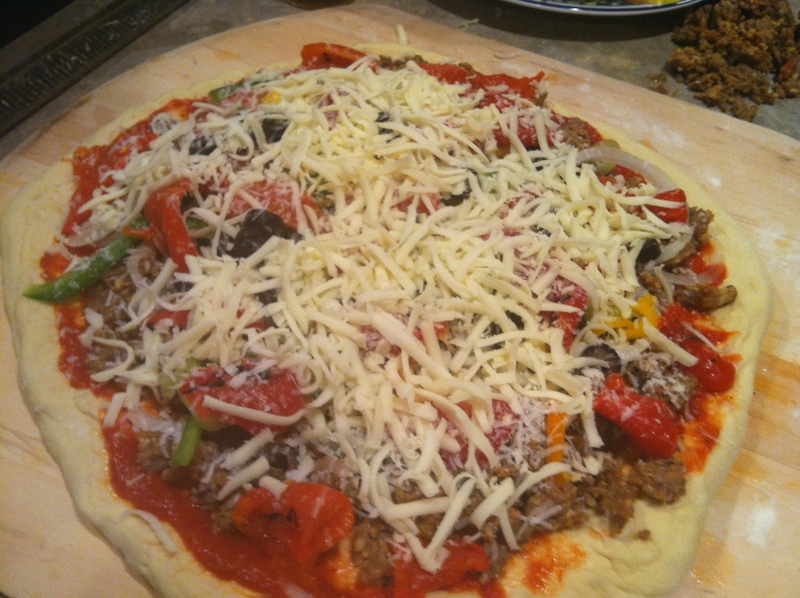 We had pizza sauce, sausage, roasted red peppers, green peppers, banana peppers, red, yellow orange peppers, vidalia onions, capers, sliced black olives, parmesan cheese and mozzarella. This was incredibly flavorful and delicious. 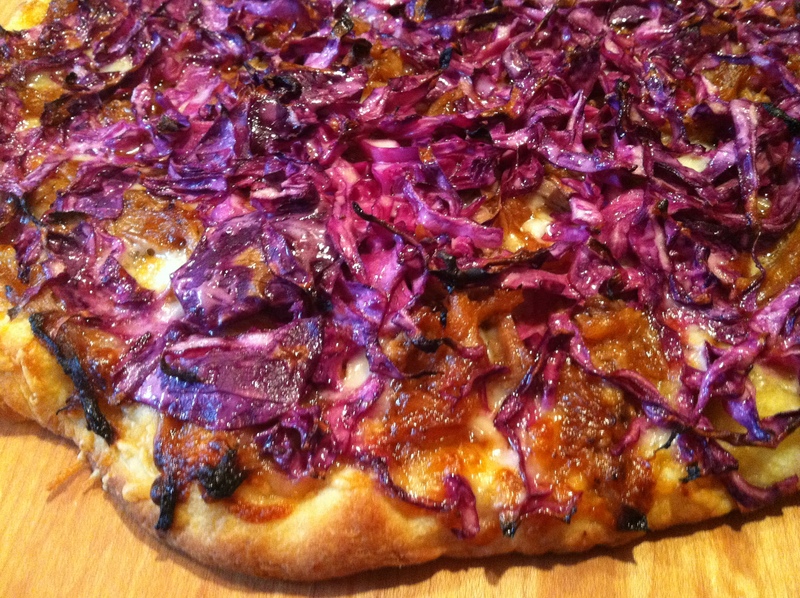 By the way, I made a parmesan pizza crust for this pizza.